Page 2 | got marko? My great aunt Ruth made the most wonderful pie she called Graham Cracker Pie. She used to sell this and other pies to local restaurants in West Virginia and guarded her recipes pretty closely. Thankfully, she taught my grandmother (her sister) how to make the pie, then my grandmother secretly taught my sister, who then secretly taught me (since I was the pie fiend). I typically make some Graham Cracker pies around the holidays. So in addition to making the pies, I thought I should document the recipe so anyone can try a Graham Cracker pie. Since Aunt Ruth passed away last year, I figured its finally safe to admit I know how to make this pie. Combine the dry ingredients and mix well. Add the butter and mix so everything is coated. Reserve about 1 Tbsp of mixture for the toping and press the rest into two 9” pie plates to form the crusts. Place the milk in the top of a double boiler and set the heat to medium high and let the milk set until it starts forming a skin on top as it heats. While the milk is heating mix the sugar and cornstarch and separate the egg yolks and whites. Set aside the egg whites for the meringue. Beat the egg yolks. Once the milk has started to form a skin, start mixing in the sugar/cornstarch mixture very slowly and continue mixing until mixture starts to thicken like a pudding. Dip out about a 1/2 cup of the mixture and add it slowly to the egg yolks and mix to heat up the yolks. Add another 1/2 cup mixture to the egg yolks and mix, then pour the egg yolk mixture slowly back into the double boiler while continuing to stir. Keep cooking until the mixture is very thick. Add the vanilla extract at this time, stir in and divide between the pie crusts. Start beating the eggs whites and slowly add the sugar and beat until soft peaks form. 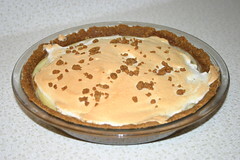 Spread the meringue over the pies and sprinkle on the reserved pie crust material to decorate. Brown the meringue slightly in a 375 degree oven for around 6 to 7 minutes. Cool and refrigerate for a couple of hours before serving. Here is a SketchUp plan for small bird house that will help a Cub Scout meet one of their Bear requirements (5b in Sharing your World with Wildlife). 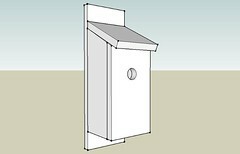 The bird house is made from standard 1×6 lumber, using less than 7 feet per bird house. The front, back and top are all full width 1×6, but the sides and bottom are ripped to 4 inches in width. The SketchUp file includes a dimensions layer you can turn on to see the major dimensions. You can either nail on the top or add a small hinge to make it easier to clean out (like our Bears did). When I made the kits up for our Bears, I took the time to pre-drill holes on the front, back, and sides to make it easier for them to get the houses together. Each was assembled with 1-1/2” brads. After seeing the neat little flashlights you could build with just a bright white LED, a resistor, some batteries and a switch, like the TicTac flashlight, the mouse flashlight and the PVC flashlight I decided to try my hand at an LED flashlight. After building a couple of TicTac flashlights that were happily received by the boys, I ran across a couple of old key chain garage door remotes that were left over after replacing an old garage door opener. I opened one of the remotes up and found that it used a 12V battery and that 7.5V was easy to get between the main opener switch and the battery, I hit upon using 2 13,000mcd bright white LEDs from Alan Parekh in series with a small resistor since I had the power. Everything was very simply done. After marking the locations in the case where I wanted the LEDs to mount, I took the circuit board from the case, snapped the case back together and used a drill press to make the two holes. I then soldered the LEDs in series to fit the mouting holes, added the resistor and a little electrical tape to prevent shorts and there you have it. We used one on a very dark walk through a boy scout camp and it threw a very usable circle of light for our little trip. 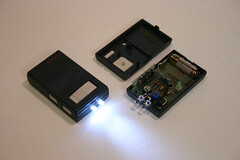 It seemed much brighter than some of the other flashlights, but that could just be an artifact of the bright white LEDs. When presented with the unique opportunity to slice 24 4-inch styrofoam balls in half, what would you do? After looking at one of them, I decided that there wasn’t any way in the world that I was going to cut them on the bandsaw. There’s enough sawdust in the shop as it is, without adding styrofoam dust to it. I’d remembered seeing a hot wire foam cutter on the MAKE: blog so I went looking for how to make my own hot wire cutter. The MAKE: blog pointed to flywoodkb’s hot wire foam cutter on instructables so I started with that as my basis. Here’s what I came up with. Visit my hot wire foam cutter set on Flickr for more pictures. Instead of the CD case project box, I just used a three wide plastic outlet box from HD to hold the dimmer and transformer. I cut the tabs off the sides since they were just in the way. Since I had some 1-by material around, I used that to make a small bow for holding the cutting wire. Twine around the top is used to tension the wire and can be adjusted as the wire heats and lengthens. Since I was tasked with cutting foam balls in half, I made up a jig to help hold them in place and guide the wire at the right height. 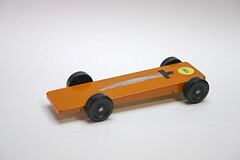 It’s nothing more than two pieces of 1-by two inches in height placed at a small angle on a board. This allowed me to hold the ball in place with one hand and while the other hand held the bow so the wire would ride the 1-by material and cut a nice clean line. The window bench was built out of jatoba (Brazilian cherry) to fit below the picture window in our living room. It might be just a little too tall as a bench, but works great as a small table. The stretchers are screwed to the sides and the holes plugged. The top is secured by table top fasteners (z clips) in grooves cut with a biscuit joiner. I’ve been playing with Google SketchUp (like thousands of others). Here is a small angled footstool, sometimes sold as a nursing footstool, drawn in Google SketchUp. The joinery is very simple, just two screws through each side into the brace, and four screws from the top, two into each side. All screws are covered with wood plugs. I built ours from oak, but any harder wood would work, cherry, jatoba, maple, ash, whatever matches your environment. Since it is somewhat shaker styled, you could even make it from poplar and milk paint it. Not shown in the sketch (yet) are the small rubber feet that I inset into holes on the bottoms of the side pieces. I left the rubber proud of the hole by about 1/8” to keep the stool from sliding on the berber carpet. Other carpets may not be as slippery. Dimensions are: top 14×10, highest point about 6 1/4”. There is a dimension layer in the sketch that you can turn on to see all the dimensions. Luckily for me, the cable provider I have right now seems to do IP address range checking so I can send outbound via their servers as my Sendmail smart host without setting up SMTP AUTH. I made my first raised panel door this weekend. It was actually easier than I thought it would be. I’ve been taking a series of woodworking classes at our local Woodcraft building Shaker inspired pieces with Glen Huey. Glen’s a great instructor, showing us how he makes the pieces in his shop. It’s nice seeing how he works to make each piece simply, and how many of the setups help to eliminate mistakes. The door (about 14×19) used rails and stiles that were 2 1/4 inches wide with 1/4 inch mortices and a 3/8 inch deep dado 1/4 inch wide with haunched tenons. The raised panel was simple to make also. We were using a 5/8 inch panel so the raised panel stands proud of the frame (just an 1/8th inch). Glen likes to use a 12 degree angle, so the edge of the panel is needs to be 3/16 inch to fit correctly in the dado. We used a zero clearance plate for the saw, then set the height of the blade so the outside edge of the blade’s tooth would just come through the panel by holding the panel above the blade as it was adjusted. We cut the end grain first and then with the grain. I was suprised by how much force it took to cut the end grain. After raising the panel we reset the saw to square up the edges of the raised panel, shaving off just a fine 1/8th inch to clean up the edge. Just a little sanding later and we were able to glue up the frame and raised panel doors. The pack Pinewood Derby was the first weekend in February. At left is a picture of #2’s Sword car on the left. Most of his races finished this way with the car about a car length ahead of the other racers. Early in the races, his car and a competitor took turns setting the track record times. But then his car actually got faster and he set the track record in his seventh race and tied it again in the ninth. Overall his car finished first in the pack, so we’ll be going to the district races again this year. At left is #1’s Trogdor car closest to the viewer. He liked the open hole in the body that I used on my car last year, so he worked up a car like that for this year’s races. His car was second or third fastest in the Webelo 2s and was in the top 20 of the pack. 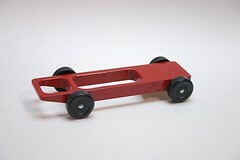 I also built two cars for the races this year, but didn’t end up with any photos of them on the track. 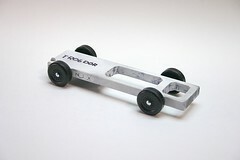 One was an open hole car similar to Trogdor above (except in red and a little thicker) to race in the open stock class. It finished 2nd to another father. I also entered a box car in the open unlimited class. 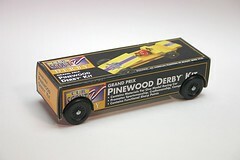 For that car I took a block of jatoba (brazilian cherry) and weighted it up and stuffed it in the box a normal pinewood derby kit comes in. It weighed in at 24.2 ounces and it managed to finish first in the unlimited class, beating out the two heavier competitors. Here are studio shots of the cars.